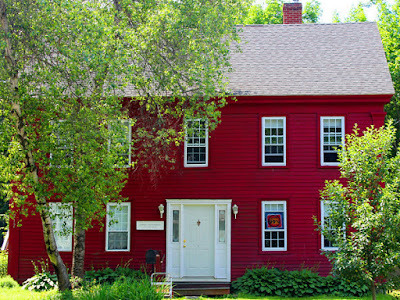 After 12 years of living in this wonderful house in Bath, Maine (built in the 1790's) we are putting the house up for sale and moving on. We bought it in a three-way partnership of Karen Wainberg, Mary Beth Sullivan and myself. Over the years we've been a house of transition (we called it an 'Intentional Community') where friends whose lives were in flux could live with us at a cheap rent until things settled down for them and they could afford to move on. One mom and her two young girls lived with us for about six years - they are like family now. But its a big house (15 rooms and three bathrooms) with a big gardening space in the backyard and it is just too much for us to keep up with as we age and Karen's life forever changed two years ago when she had a stroke. So it's time to make the change. Karen and her daughter have already found an apartment in nearby Brunswick and will move before this month is over. MB and I will stay in the house until it sells and in the meantime we'll be looking around for a place to live in the Bath and Brunswick area. Over the years we've held many community pot luck suppers and had lots of meetings here. We called it the Addams-Melman House (AMH) - named after Jane Addams the founder of social work in the US and Columbia University professor Seymour Melman who was the father of the 'economic conversion' movement that works to convert the war machine to peaceful and sustainable production. I'll miss gathering the branches that fall from our many trees for kindling for our two wood stoves in the winter. I'll miss stacking and bringing in the wood, starting the fire in the morning, and losing myself watching the flames dart inside the fire box. I'll even miss shoveling the snow (though I will likely still get a chance to do that no matter where we move). Thanks to all our dear friends who came to the AMH during these years. Some folks in Bath we've been told called it the 'Peace House'. Many people in the community knew what we were doing and I must say our neighbors were always really good to us. We'll miss them as well. Intentional living seems to be a strength for you all. Proud of you all for embracing change. Grateful to have been part of the A-M House community which will always be a fond memory. community Housing, not a co-housing. office in Colombia U. in 1990. I missed to be with you in the Addams-Melman House (AMH) - named after Jane Addams the founder of social work in the US and Columbia University professor Seymour Melman .